Is the Critter spray gun the right tool for your job? We have all admired the flawless paint finish of store-bought furniture. But I never seem to be able to achieve the same professional-looking finish at home, certainly not with an ordinary paint brush. The brush strokes are never even, and as for those stray brush hairs … Don’t get me started. Spray-painting is the next obvious step. It’s guaranteed to give you a more professional finish because it is more precise. But spray-painting is a skill, one that requires a lot of patience and practice – and the right tool. How Does The Critter Siphon Spray Gun work? What Is It Suitable For Spraying? Who Is The Critter Gun Made For? The spray gun unit comes with a paint jar attached. To unscrew the paint jar from the gun, hold the jar with one hand and unscrew the jar ring with the other. Don’t be tempted to use the body of the gun as a lever as you could disturb the alignment. Stir your paint or coating of choice thoroughly. Check its viscosity, as you might have to thin the material. If you encounter lumps, you will have to strain the paint. Pour the paint into a jar. Be careful to leave enough room for the thinners, if needed. Screw the jar back onto the spray gun. Check the position of the liquid nozzle in the jar, so it aligns with the air nozzle. Then connect the compressor airline to the gun. Remember to try out the spray gun first on a test surface to determine the correct air pressure – it is recommended you start at 30 psi and increase gradually as needed. Also, check if you’re happy with the viscosity of the material. Hold the spray gun at 3 to 5 inches from the surface. Press the trigger and start spraying from left to right, maintaining a steady travel speed. Change direction and ensure each pass overlaps the previous one. Always start and finish a project before stopping for any length of time, to ensure the paint doesn’t run. When you’re finished, detach the jar from the spray gun, and screw on the jar top, so the paint is ready to use for the next project. The spray gun must be cleaned after use. The manufacturers of the Critter say it is ideal for medium to small projects where using big spray guns would be too much of a bother and take too much time. The materials you can spray range from a variety of paints (water-based including chalk paint as well latex-based) to stains and even varnish. It can be used to spray even surfaces like doors and walls as well as more intricate items, such as antique furniture that features a lot of decorative woodwork. It’s perfect for arts and crafts and can be used quite easily to do stencil work. In addition, it can be used for auto-body repair spray work. 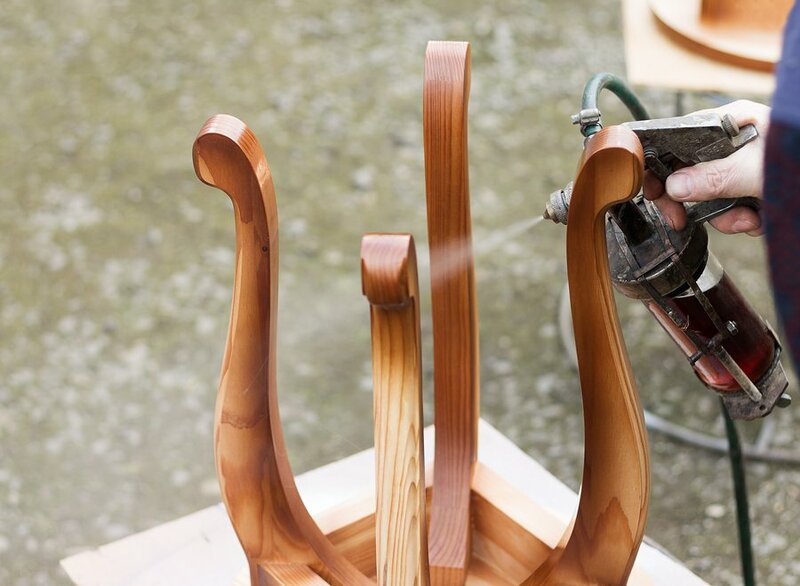 The spray gun can be used by anyone who wants to achieve professional finishes on their work – from the beginner to the serious woodworker or DIYer, and anyone in between. It has been designed for anyone who prefers something easy to use and easy to dismantle and clean. The Critter spray gun is reasonably priced compared to similar spray guns. The 22032 118SG model weighs in at 1.6 pounds and, with dimensions of 8×6.9 x 4 inches, it is compact. Obviously, you’ll need your own compressor, but If you’re an avid DIY-er, you should have a compressor in your tool-shed anyway. You’ll need a minimum 3/4 horsepower unit with an output of 3 cfm at 90 psi. The kit comes with a standard 16-ounce Mason jar to hold your paint, but the unit can be adapted to accommodate other jars. It is a no-nonsense piece of machinery – which mean fewer parts to lose – and there are only two adjustments you need to make: to regulate the air supply and the height of liquid nozzle. The unit comes with only one nozzle, but it can spray a wide variety of materials. The Critter has a spray circumference of 0.5- to 2.5 inches. I found the Critter Spray Gun as easy – or easier – to use as other products in the same price range, such as the K-Grip Siphon Spray Gun. Unlike some spray guns, the Critter uses a standard-size Mason jar to hold the spray material. This, I found, is a huge plus, as you can purchase extra jars from almost any store, for next to nothing. And the Critter can be adjusted to suit other jars as well. There are very few ways you can mess up with this spray gun. It’s a case of fill, point, and spray. Some Critter spray gun reviews suggest the trigger can become a sticky or gummed up. But that’s easy to correct if you strain the paint first before filling the jar. And you must clean the equipment properly after using it. That leads me to another thing in the Critter’s favor: cleaning it is so easy. If you’ve been using water-based paints simply run the spray gun under water. To make extra sure it’s clean, you can run a pipe cleaner through the tubes and the nozzle. If you’ve been using latex-based paints, connect another jar filled with thinners to the gun, swish it around, spray some through the nozzle. And remove the jar and lid, wipe off the jar gasket and cover plate. And seal again. The Critter is a terrific addition to any toolbox. Its straightforward design means anyone can use it, from hobbyists to the more experienced woodworker. It delivers the perfect finish, especially on smaller to medium-sized projects. I’d suggest keeping bigger spray guns in reserve for your major projects.